All Herschel iQ system components are available with free next working day delivery. Next working day delivery is available when you order before 12pm (excluding weekends). The Herschel iQ system provides convenient temperature management for every Herschel heater in your system, using either the standalone MD1 Thermostat, T1 Thermostat in conjunction with individual R1 Receivers, or R1 Receivers in conjunction with the iQ Hub. All three setups can be controlled over WiFi through the iQ Hub and the Herschel heating app, for instant and responsive heater control on the move. How does the iQ system work? The iQ system works in three different configurations, enabling varying levels of control depending on your requirements. Configuration 1: MD1 + Optional Hub. Individual Herschel heaters (up to 3600W) hardwire directly into the MD1 Thermostat for en-masse control. This self-contained setup is best suited to single-room control in smaller spaces or new builds where hardwiring is the preferred option. A new MD1 thermostat will need to be purchased for each room you wish to control. Unlike the other controllers in the iQ system, the MD1 reaches temperatures up to 45 °C – making it a superb choice for hot yoga studios. The MD1 can also be connected to the iQ Hub, enabling WiFi control from a compatible smart device. Configuration 2: R1s + Hub. Herschel heaters (up to 1955W) wire into an R1 Receiver. Each R1 links to the Herschel heating app and is controlled over WiFi via the iQ Hub. This setup is suited to controlling a small number of heaters and can be particularly useful for ceiling-mounted installations, as you don’t need an additional thermostat mounted nearby to control your heaters. Configuration 3: R1s + T1s + Optional Hub. Herschel heaters (up to 1955W) wire into an R1 Receiver. A T1 Thermostat then controls the R1s on a room-by-room basis. This configuration supports heater zoning when you purchase additional T1s for each room. T1 Thermostats can also be linked to the Herschel heating app for WiFi control in conjunction with the iQ Hub. Download the T1 Room Thermostat user guide here. Download the MD1 Hardwired Thermostat user guide here. Download the R1 Receiver user guide here. Download the iQ WiFi Hub installation instructions here. Please ensure that any thermostat or controller is placed in a location away from any hot or cold spots. Controllers or thermostats should not be installed in bathrooms. If you want to control heaters in your bathroom, you will need to make sure the heater is wired into the receiver in a location which falls outside the “wet” bathroom zones – namely, at least 60cm away from any source of running or splashing water. Receivers must not be installed anywhere where there will be risk of water contact – whether by dripping, splashing, or touching with wet hands. This thermostat can be wall mounted DIY using the mounting plate and fittings provided. Each unit also comes with a stand if you prefer your thermostat to be free standing. An unlimited number of R1 Receivers can be connected to the T1 Thermostat. The MD1 is not suitable for DIY installation and will require a single gang 46mm deep pattress box for recessing into a wall, with access to the mains circuit powering the heaters. R1 receivers must be hardwired into your heaters and a mains power supply by a qualified electrician. R1 Receivers have a max load of 10 Amps (2300W at 230V), however, the manufacturer recommends a 8.5 Amp continuous load (1955W at 230V) to ensure the longevity of the receiver. The iQ Hub connects to your WiFi router via the ethernet cable provided. The Herschel iQ app can be found on the Google Play Store for Android devices or the App store on iOS devices. 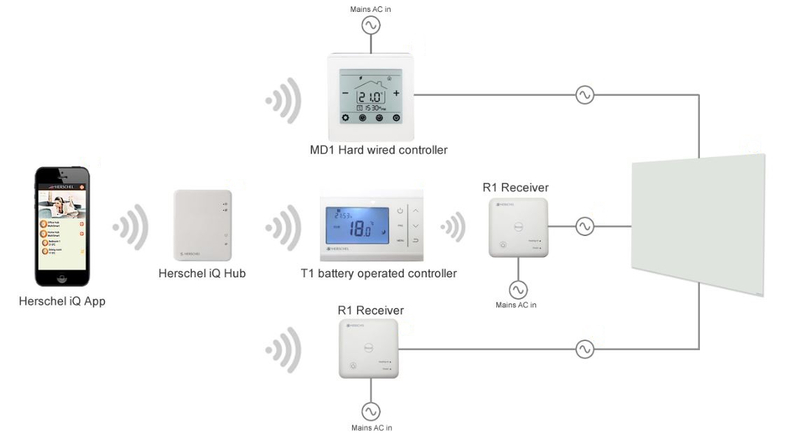 Please note, only third generation T1 Thermostats and R1 Receivers can be connected to the iQ Hub. Second generation R1 Receivers can’t be used with a third generation T1 thermostat and vice versa. If you’re unsure what generation product you require, please contact our sales team. The Herschel iQ System comes with a 1 Year Manufacturer’s Warranty.